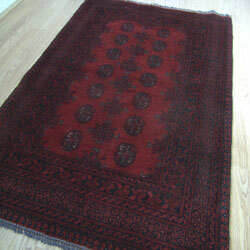 Afghan runners are full of character, each runner is hand-knotted in Afghanistan and areas bordering Afghanistan. Locally sourced wool is always used, the majority of the time weavers use the wool from their own herds. Our collection is mainly red with black detailing, we sometimes stock rust or terracotta runners, please contact us for stock updates. Afghan runners are handmade so please be aware no two runners are identical.